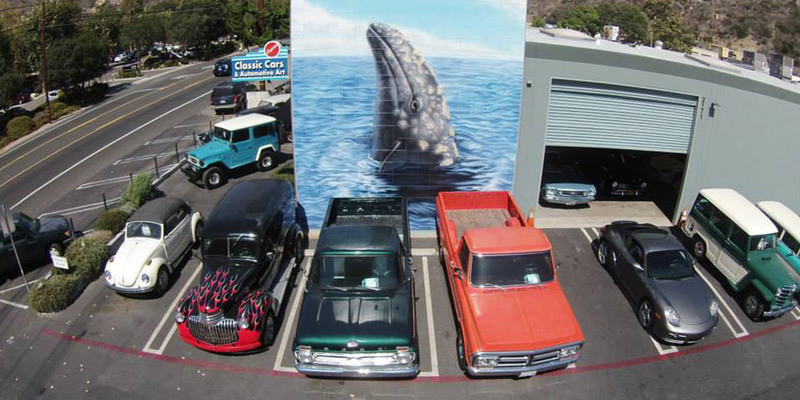 Laguna Classic Cars & Automotive Art is the creation of Andy and Beth Coyle, long-time Laguna residents. Andy began his career in the auto business by giving tours at the Ford River Rouge manufacturing complex in Dearborn Michigan before working in the Lincoln Mercury Division in sales and marketing positions. After being transferred to southern California, Andy went on to a successful career managing and owning car and RV dealerships. Andy also competed and won in several auto racing organizations including SCCA Cal Club, International Road Racing Association, and NASCAR Winston West series and NASCAR Super Late Model series. Some of the tracks he has competed on include Riverside Raceway, Rockingham Speedway, Irwindale, Mid America Raceway, Sears Point, Monroe Washington Fairgrounds, and Tucson Raceway Park. Since moving to Southern California over 30 years ago Andy knew that Laguna Canyon was the ideal location for selling interesting cars and auto related art. Laguna Beach, and especially Laguna Canyon, is home to many car enthusiasts, collectors and craftsman. Laguna is also world known for its exceptional natural beauty and thriving art culture. Laguna Classic Cars & Automotive Art will be at the cross roads of the art and classic car cultures.